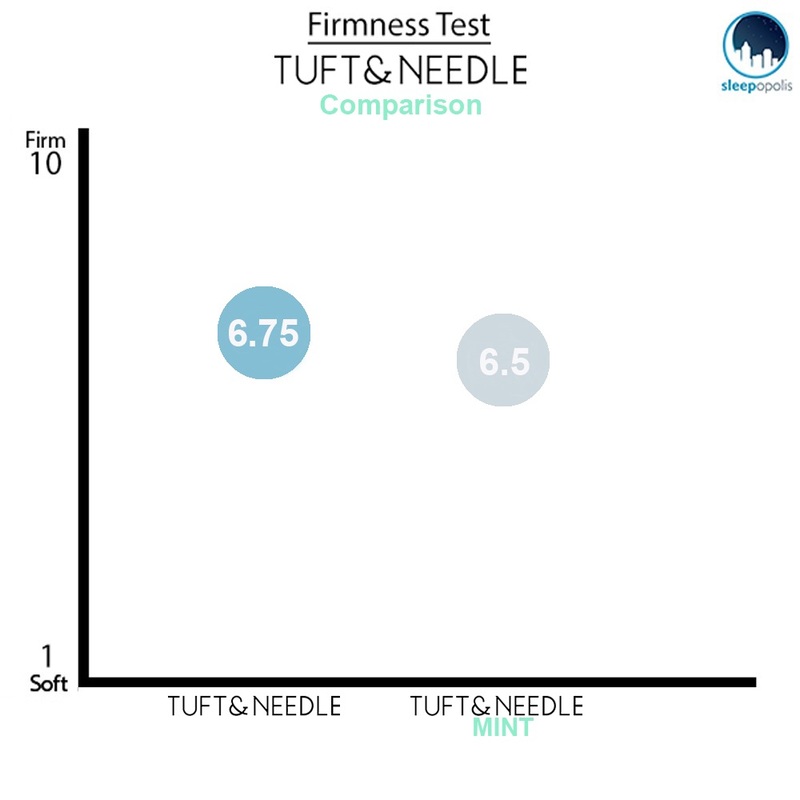 Tuft and Needle Comparison: Is the Original or Mint Mattress for You? 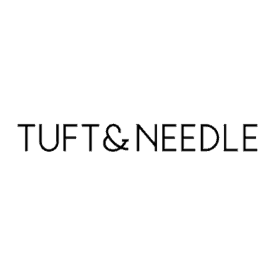 Founded in 2012, Tuft & Needle has become one of the largest bed-in-a-box retailers on the market, a pretty remarkable feat considering that the company has spent most of its operative years selling only one mattress. But that all changed this past February when, much to the clamor of fans on Reddit, the brand finally unveiled its second model: the Tuft & Needle Mint. Today, I’ll be taking a side-by-side look at the Mint and its predecessor, trying to suss out what makes them similar and, more importantly, what sets them apart. And who knows—by the end of this comparison, you might just discover the bed of your dreams! Tuft and Needle has been advertising the Mint as a sort of “next step” for the brand, so you’ll notice that it takes a lot of elements from the retailer’s flagship mattress, but elevates them to new levels of comfort. In this way, the differences between the two beds are really based in how the new model seeks to extend what was already working well in the original. So before we dig into the differences between the two beds, let’s chat a little about the characteristics they share. All-foam construction – The T&N and Mint beds are built entirely of foam, which means they’re designed with both pressure relief and support in mind. While the newer model boasts an additional transition layer (making for three sections as opposed to the T&N’s two), a straightforward foam construction acts as the solid base upon which each mattress expresses its distinct personality. Cooling – An integral part of both beds’ designs is an emphasis on cooling. In the T&N, we see this in the moisture-wicking cover and the graphite infused into the foam comfort layer. In the Mint, the cooling is achieved with the addition of 30% more graphite and gel beads split between two layers. So while cooling is big for both mattresses, the way it’s expressed makes for an important difference between the two. Firmness – Another unifying characteristic between the two beds is that they only come in one firmness level, which bucks the current trend in the bed-in-a-box sphere of offering multiple firmness options for a single mattress model. There’s a slight variation in just how firm each Tuft and Needle bed is, but they both hover around medium firm. Now that we’ve got the similarities out of the way, let’s dive straight into what makes these beds so unique! As we discussed up top, the biggest thing you’ll notice is that the Mint is going to take what the T&N’s working with and twist it into something a bit more advanced. 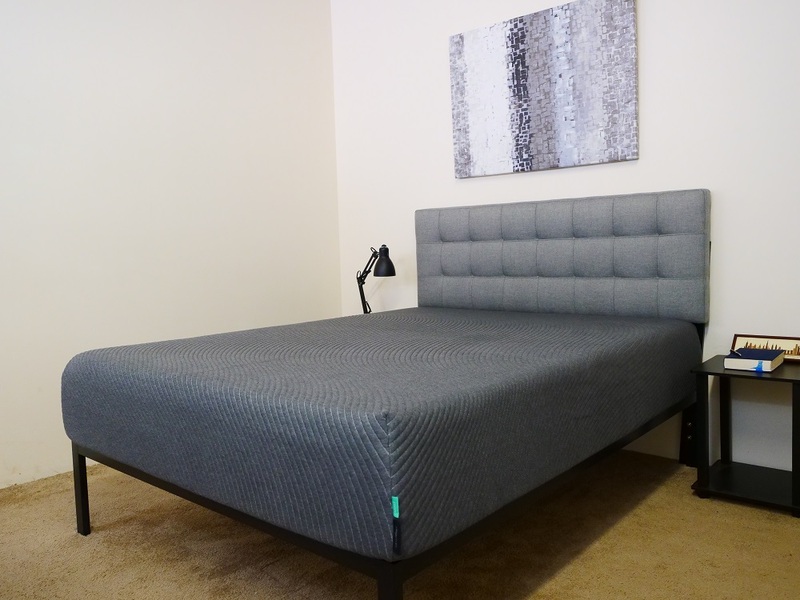 I’m going to walk you through a brief synopsis of each bed’s specific construction below, but would encourage you to also check out our full reviews of the T&N and Mint. Cover – The cover of the T&N is made of a thin polyester/Tactel blend. Tactel is a cotton substitute known for its moisture-wicking properties, which means it’s going to dry a lot faster than a traditional cotton fabric would. This fabric will help with both cooling and breathability throughout the mattress. Comfort Layer – The comfort layer is comprised of 3” of Tuft & Needle’s proprietary Adaptive Foam. 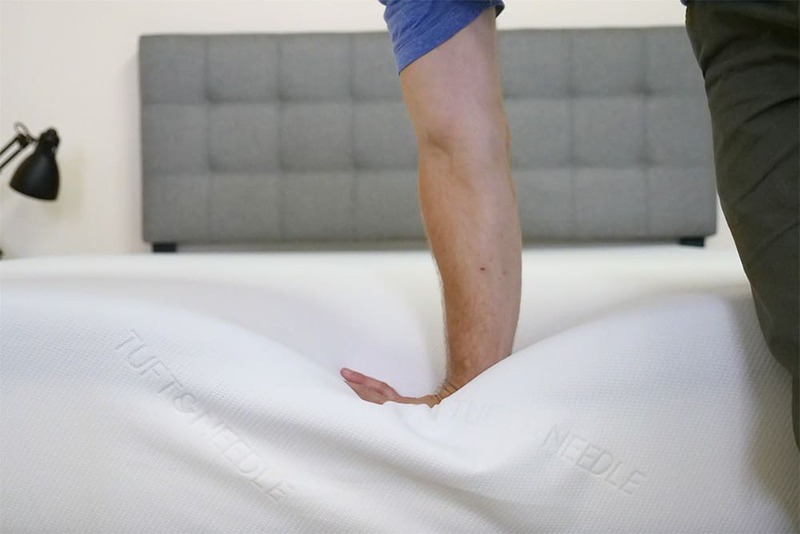 This material is soft enough to provide some quality pressure relief to the sleeper, but also bouncy enough to prevent that stuck-in-the-bed feeling. This section is also infused with gel and graphite, which helps stretch the cooling properties of the cover into the rest of the structure. Base Layer – And finally, the base, which is built with 7” of high-density poly foam. This layer acts as the foundation for the bed, giving it its structure and support. Cover – The cover is set in a pleasant charcoal color and made of a polyester blend. The fibers are knit together, which makes for a thick and cozy feel. I should add that the fabric is resistant to peeling, so it’s an especially resilient material. Comfort Layer – The comfort layer is built with 3” of Tuft and Needle’s Enhanced Adaptive Foam. This material is similar to the one used in the T&N, but with some added oomph. In addition to being incredibly soft and responsive to pressure, it’s also infused with 30% more graphite than the Adaptive Foam used in the flagship model. This material helps draw body heat away from the sleeper for a cool night’s rest. Transition Layer – Below the comfort layer, you’ll find an additional 2” of the brand’s Enhanced Adaptive Foam. This section is infused with gel beads, which help to extend the cooling properties of the top layer throughout the rest of the mattress. It’s also firmer than the comfort layer, functioning primarily as a transition between the different materials in the bed. Foundation Layer – And finally, the base. 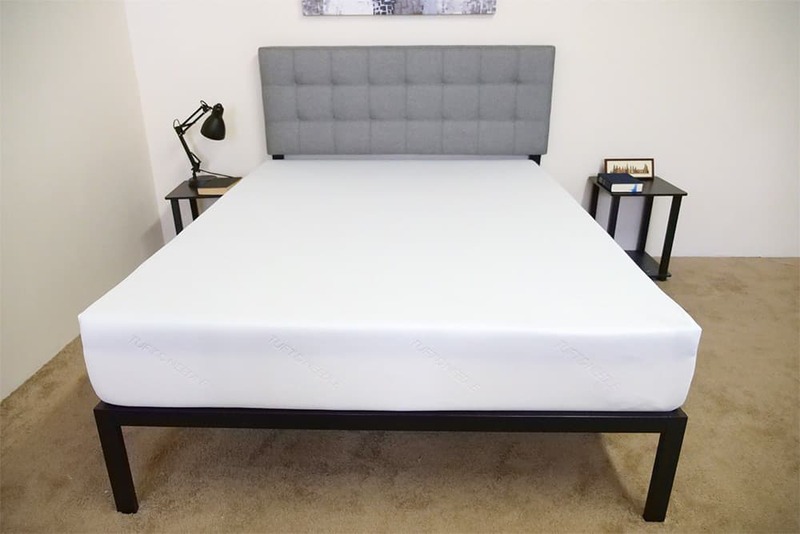 This layer is comprised of 7” of high-density poly foam, which establishes the bed’s structure and acts as the support for the softer foams up top. This layer also features some added edge support, which helps to firm up the sides of the mattress so you’ll be able to use the entire surface area of the Mint. As you can see, the clearest distinction between the two beds is the amount of different materials used. I’d argue that the Mint is a sort of “souped up” version of the T&N, as it takes the original’s straightforward construction and amps it up to a whole new level. 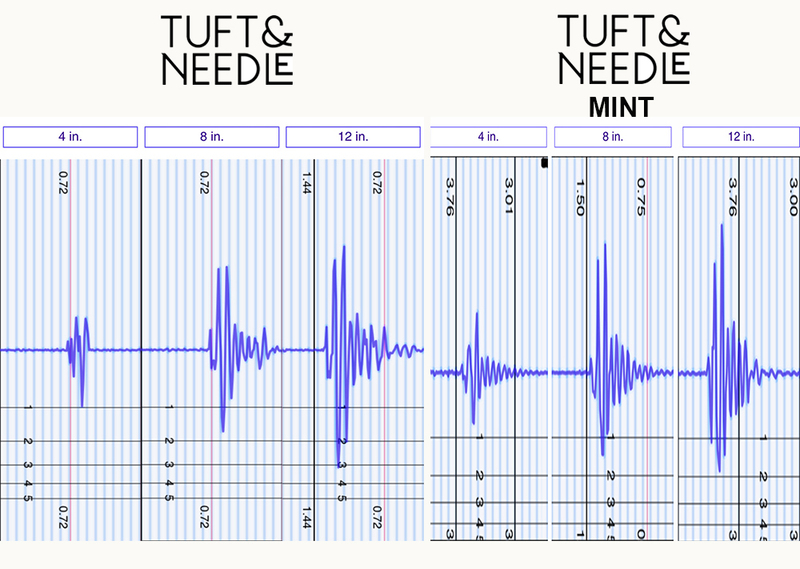 Given how much the mattress industry has changed since Tuft & Needle first opened up shop, it makes sense that there would be this kind of variation between them: T&N is a great bed for 2012 in the same way that the Mint is a great bed for 2018. That being said, you’re going to experience fantastic comfort and pressure relief from both models, as well as some quality cooling and breathability. The question for you to answer is whether or not the added materials in the Mint justify its purchase, knowing that its Queen costs $895 compared to the T&N’s $575. Nitty gritty details aside, let’s get down to how these mattresses feel. Knowing what we know about these Tuft and Needle sisters, we could probably make some guesses as to how they’re going to sleep (the Tuft and Needle Mint will be like the T&N… but better?). To figure out whether or not this hypothesis is true, let’s gab about the factors that contribute to each bed’s vibe. First up: firmness. Since everyone feels the firmness of a mattress differently, I brought in three other testers to help me try out each of these Tuft & Needle beds. Below is the graph showing the average firmness rating for the mattresses. My testers gave the T&N an average rating of 6.75, which is just a hair above the industry standard of 6.5 for medium firmness. I personally gave the mattress a 7, as the bed features a lot of buoyant support. While you’ll slightly sink into the T&N when you first lie on it, the bounce of the Adaptive Foam coupled with the foundational high-density poly foam is going to lift you up and out of the structure. This means that as you press further into the bed, the bed is going to press back up to meet you, preventing you from feeling stuck in the mattress. A wide range of sleepers will like this quality, but back and stomach sleepers will be particularly pleased. My testers gave the mattress an average firmness of rating of 6.5, which syncs up perfectly with the industry standard for medium firmness. I personally gave the mattress a 6, finding it to be just a touch softer than medium firm. While you’ll feel some good support from the high-density poly foam in the foundation layer, the five inches of Enhanced Adaptive Foam up top are going to allow you to really sink into the structure for immediate comfort. This mix of pressure relief and support is going to be great for a variety of sleepers, but especially those who slumber in multiple positions. Next, we’re going to take a look at sinkage, or the amount that you’re likely to sink into the bed while lying on top of it. To visualize this, I’ve placed balls of different sizes and weights (a 6 lb medicine ball, a 10 lb steel ball, a 50 lb medicine ball and a 100 lb medicine ball) on the surface of each mattress and measured how far into the structure they sank. While the T&N and Mint experienced pretty similar amounts of sinkage, the results for the two middle balls in each test are actually quite telling of their different feels. With the T&N, you’re going to sink quickly and deeply into the top layer of Adaptive foam, but once you hit the high-density poly foam base, the sinking lightens up. Conversely for the Mint, the sinkage here is more gradual, as you slowly work your way through the foam in the comfort and transition layers before meeting the dense foundation. All in all, I’d say the Mint sleeps a bit softer than the T&N, with its added foam section providing a pleasant transition from the gentle comfort layer into the high-density base below. If sinkage is important to you—let’s say if you’re a side sleeper or someone who needs pressure relief—you’re going to feel slightly more of it from the Mint than the T&N. But also keep in mind that both mattresses feature a lot of great bounce, so you’re not likely to feel stuck in either of these beds. Whether it’s with your long term partner or a college buddy dropping into town for a reunion weekend, you’re bound to share your bed with someone during your mattress’ tenure. That’s why it’s crucial to consider motion transfer when making a big mattress purchase. Once again, these are fairly similar results, but I’d give a slight edge to the Mint. Though the structure is imbued with a hearty amount of supportive bounce, the mattress is pretty good at isolating motion, which could make it a solid option for couples. That being said, the T&N still performed okay on this test, but the addition of the firm transition layer in the Mint combined with its enhanced version of the brand’s proprietary Adaptive Foam makes it the clear winner here. The first thing to figure out is what kind of construction you’re after. If you prefer a no-frills, straightforward design, you can’t go wrong with the T&N. However, if you like a little added pizzazz (and don’t mind paying for it), you might want to consider the Mint. The second comes down to value. There’s a cost difference between these two beds, with a Queen size Mint coming in at $895 when compared to the $575 price tag of a T&N Queen. 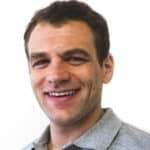 You’ll get a lot of bang for your buck regardless of the Tuft & Needle you choose, but if value is important to you, I’d suggest going with the flagship model. And third, how often will you be sharing your bed? If you sleep with a bed mate ever night, I’d recommend going for the Mint. 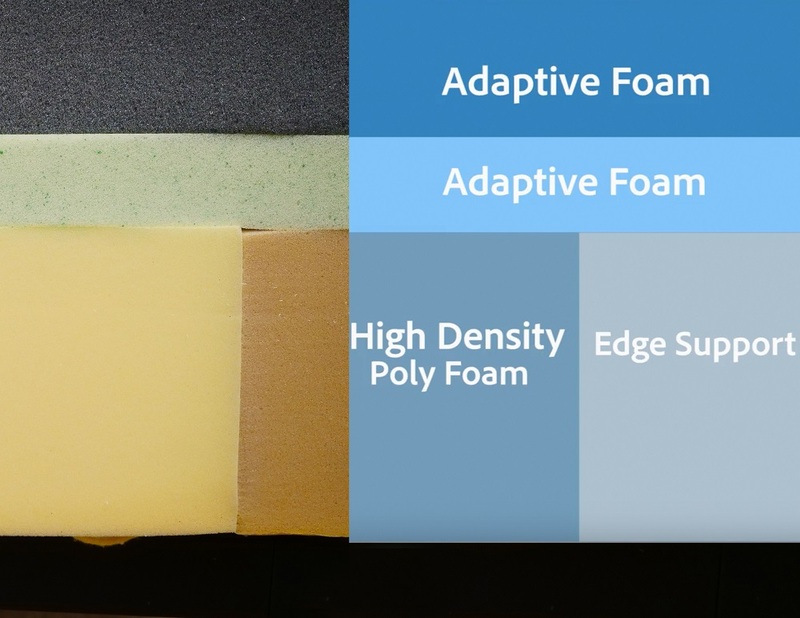 Not only will the balanced foam feel satisfy a wide range of sleepers, but the added edge support in the base will allow you to use the entire surface area of the mattress. This bed would be wonderful for anyone who sleeps hot. The moisture-wicking properties of the cover are particularly good at keeping things cool. The T&N would also be a solid pick for anyone concerned with value, as it provides a lot of great comfort for an affordable price. The mattress also provides a pleasant balanced foam feel, which will be great for anyone in search of both pressure relief and support. Given the bed’s good motion transfer results and added edge support, I’d say the Mint would make a good mattress for couples. The addition of the extra transition layer in the Mint also makes it a fantastic option for anyone who wants pressure relief without that stuck-in-the-bed feeling. As with the T&N, the Mint offers a fabulous balanced foam feel, combining satisfying sinkage with strong support throughout. Well that about does it for this Tuft & Needle comparison! Hopefully it’s answered all of your questions about the brand’s two great mattresses, but in case it hasn’t, feel free to leave a comment on the video above and I’ll get back to you ASAP.